Cardinal Sean O’Malley, OFM, Cap. was the main celebrant and 37 priests concelebrated the Mass for Sr. Michelle Hernandez’, PDDM 50th Jubilee Celebration of her Religious vows in the congregation of the Sister Disciples of the Divine Master. 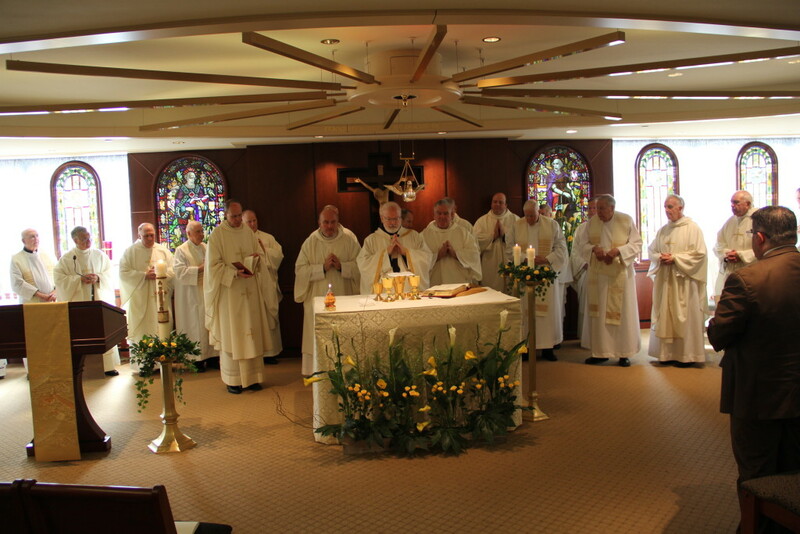 The celebration took place on April 19, 2015 at the Pastoral Center’s Bethany Chapel in Braintree, MA. 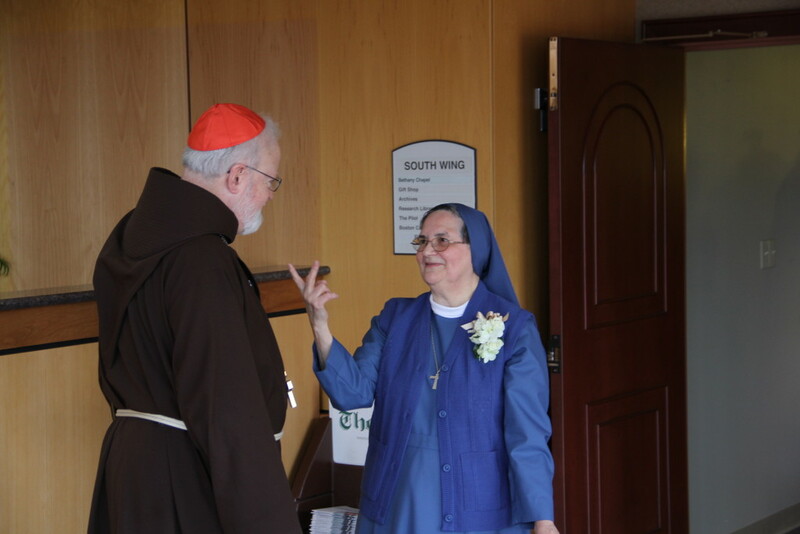 Sr. Michelle Hernandez, PDDM with Cardinal Sean O’Malley, OFM Cap. 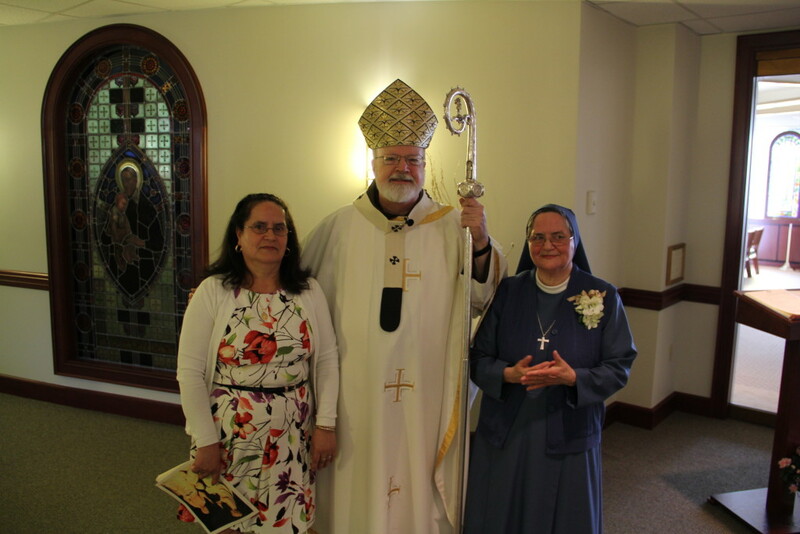 Sr. Michelle was born in Santa Cruz, Mexico and was a part of St. Peter and Paul Parish Church. She was one of twelve children with eight sisters and three brothers. 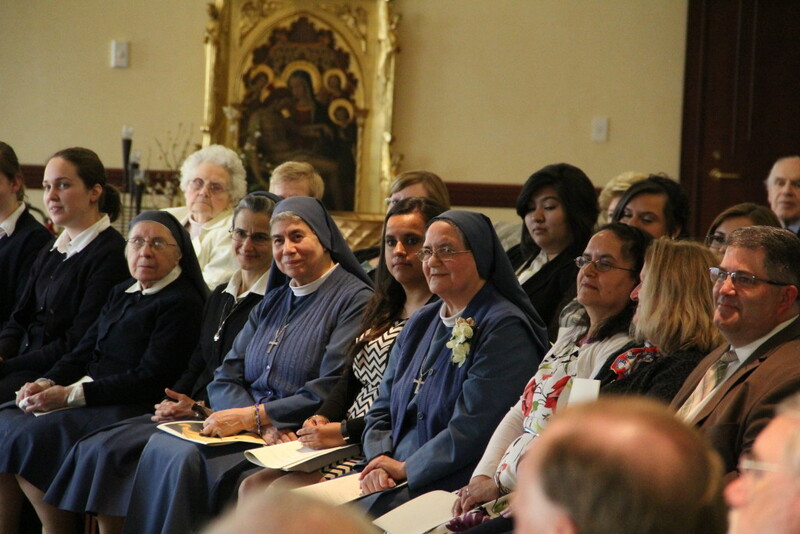 She met the Sister Disciples of the Divine Master through her cousin. He had entered the seminary in Mexico and on one of his study breaks he brought Michelle a magazine of the Sisters. He told her, “you can make it in the convent.” She had doubts because she felt that her father was not favorable to the idea. However, her cousin invited her to push forward. When Michele presented the idea to her parents, her father responded by saying, “are you serious?”, while her mother said, “you in the convent, you only like to go out! out out!. Her parents were not sure that her outgoing personality would work in the convent. Yet her parents were supportive of her wish if it was going to make her happy. 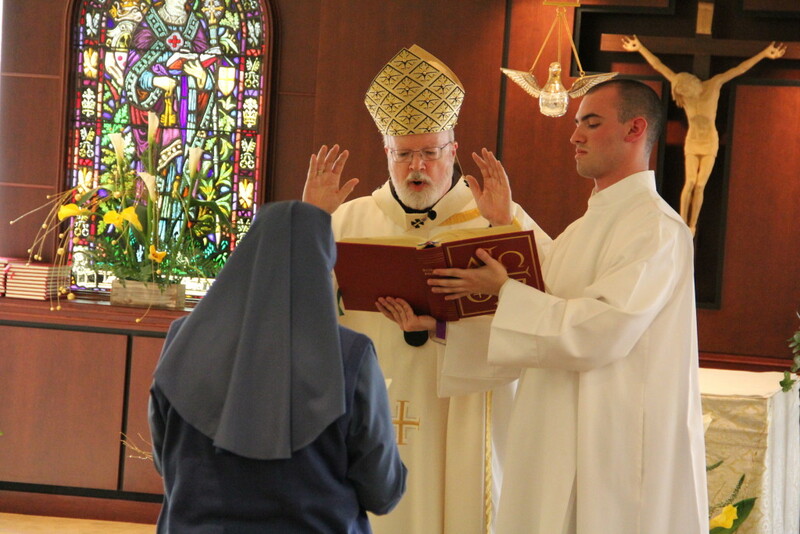 When Michelle’s cousin returned to the seminary, he told the Sisters about her. Soon after, he called Michelle to tell her that the sisters were waiting for her. Michelle’s father drove her to the convent. Before he left, he told her, “If you are happy, stay! If you are not happy, you call me! She liked it right away. She never turned back! Sr. Michelle entered the convent on February 4, 1962. She would make her profession of vows on March 25, 1965. 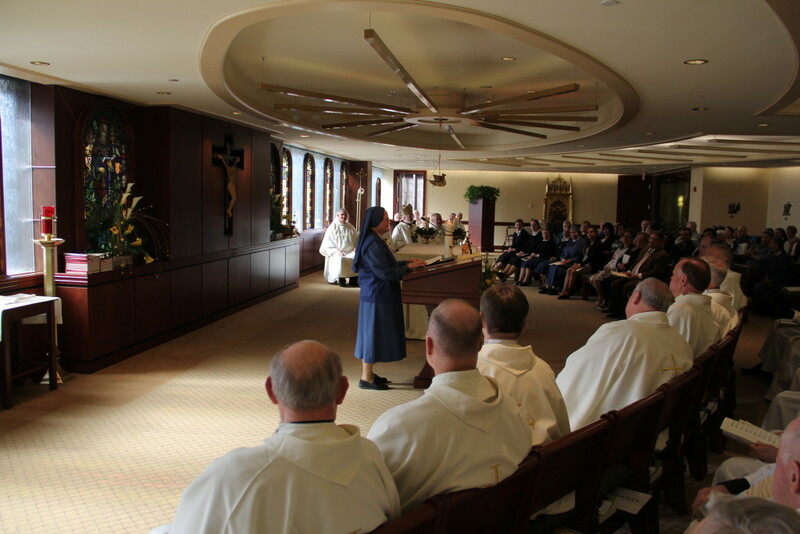 Sr. Michelle seated in the front row at the Mass at Bethany Chapel of the Pastoral Center. In April 1967, Sr. Michelle was asked by her superiors in Mexico to embark on a missionary mission to the United States. She was being assigned to the American Province of the Congregation. 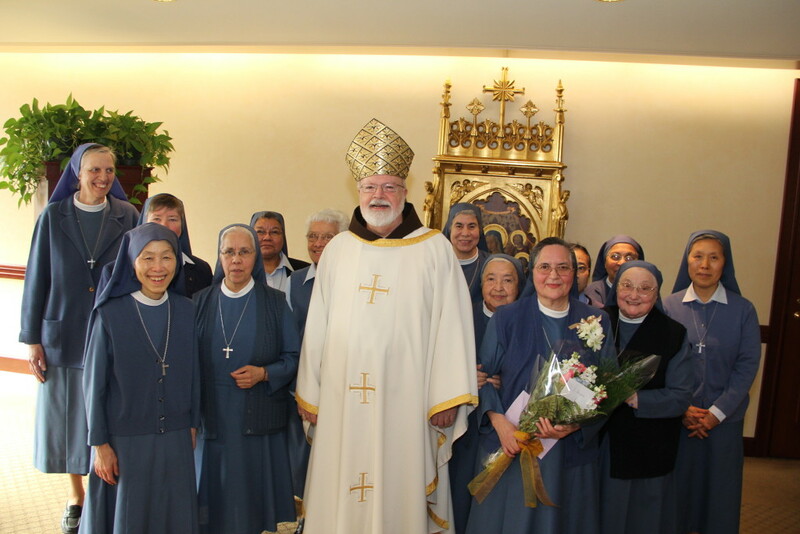 Within a few months of arriving in Boston, Sr. Michelle was assigned to the community of Fresno, CA. where she would work from 1967-1973 serving the retired Bishop of Fresno. She then had the following assignments, 1973-1974 in Derby, New York; 1974-1976 in Dearborn, Michigan; 1976-1977 in Fresno, CA; 1978-1991 working for the retired priests of Boston at Regina Cleri residence. 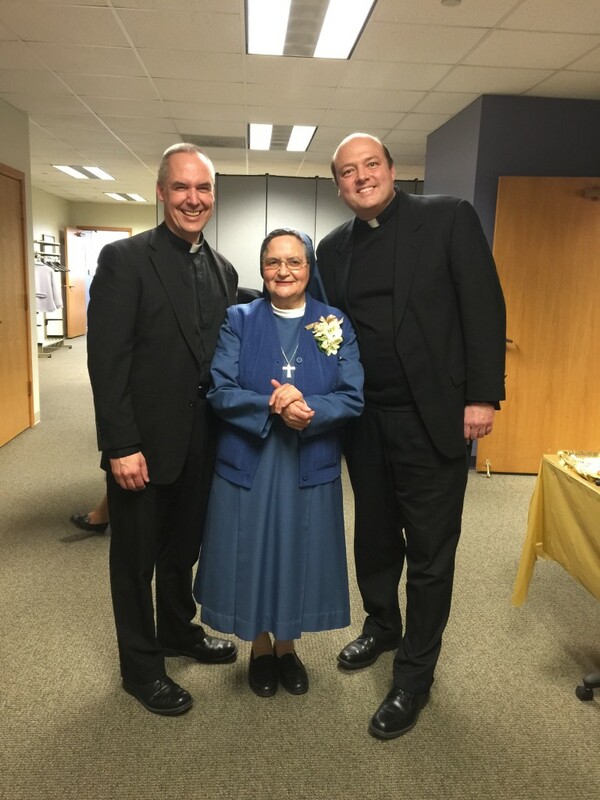 She celebrated her 25th anniversary in Boston with Auxiliary Bishop Roberto Gonzalez. She then returned to Fresno (1991-1997) to assist with the elderly sisters of the Congregation. From 1997-2000 she served in Boston; 2000-2003 in San Jose, CA; 2003-2006 in Los Angeles, CA; 2006-2007 at Regina Cleri in Boston. In 2007, she returned home to take care of her dying father for a few months. She then served in New York from 2007-2009; in the Pastoral Center in Boston from 2009-2014; and has been back at Regina Cleri since 2014. Sr. Michelle offering a few words of thanksgiving at the end of the Mass. 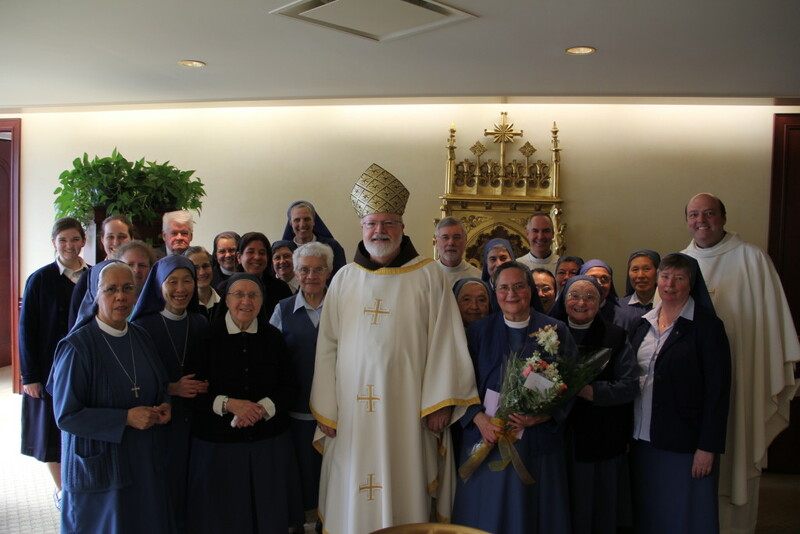 Daughters of St. Paul Celebrate Profession Jubilees 2015…25 years, 60 years and Yes…75 Years!